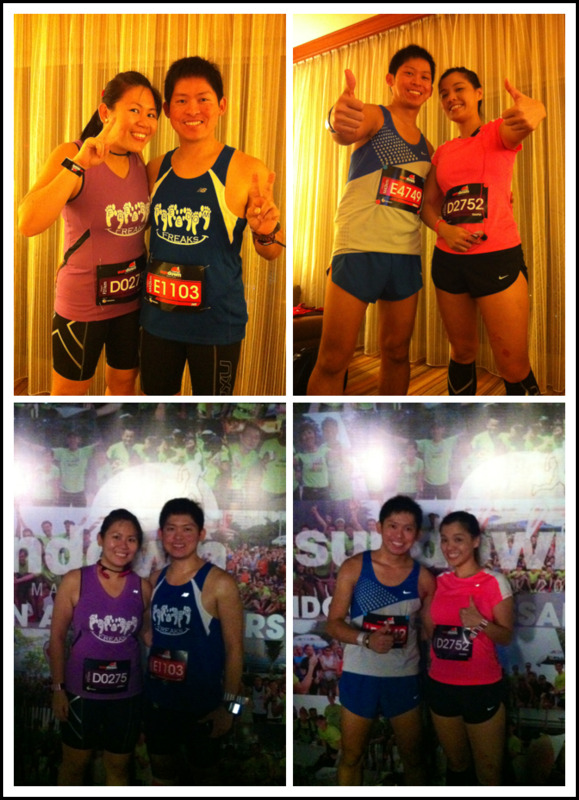 It was a Marathon race day plus a one-night hotel stay with my mum, Eileen (Fiancee), Jeff (Brother) and Yingshan (Jeff's girfriend) at Swissotel The Stamford on Saturday (26 May 2012). Never done this before but we reckon it was a good arrangement, heading straight to the hotel for a good shower and rest right after the race. 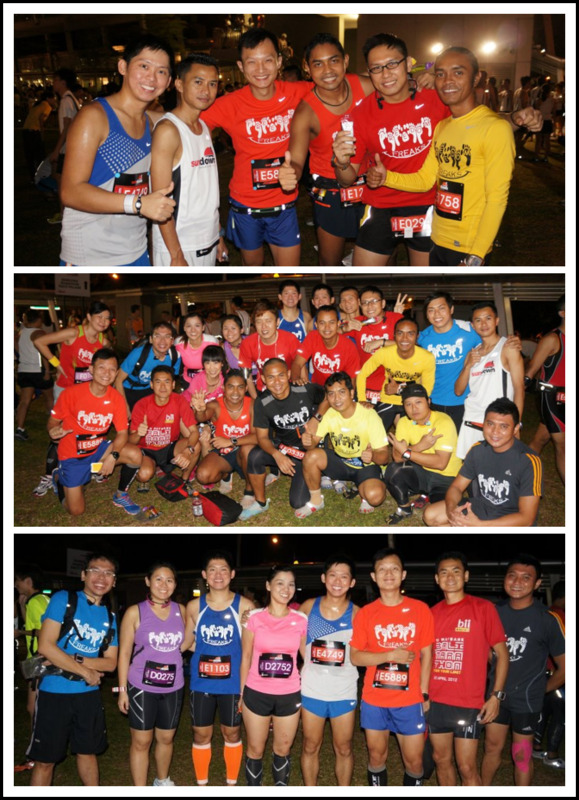 We reached Nicoll Highway open field and met up all our Freedom Freaks runners 2 hours just before the race started. Here we are! The race was about to start and I was together with The King Sam-E, Asree, Izhar, Izat and Jeff at the first pen of starting line and waiting for our Sundown 42km race to flag-off. Immediately after the race was flagged off, everybody started to "CHIONG" all the way in their races. I don't understand why these crazy people did that, and yeah, I was one of them too. Hah! While running my 1st km, someone called my name from behind. 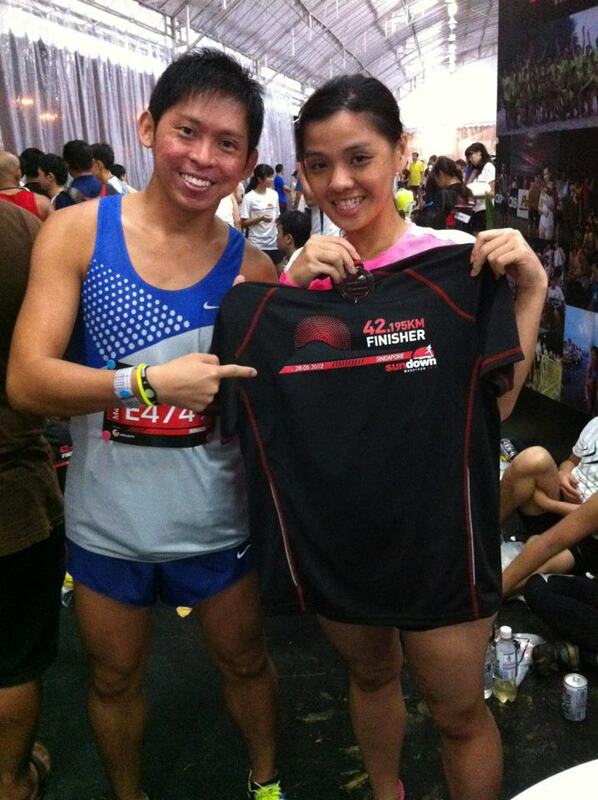 I turned around and I saw Robson Phan, one of our local elite marathoners and Ironman. Robson was my 42km pacer at last season's SCMS 2011 but unfortunately I was not good enough to keep up his demon pace and lost him at 18 km marker @ ECP. 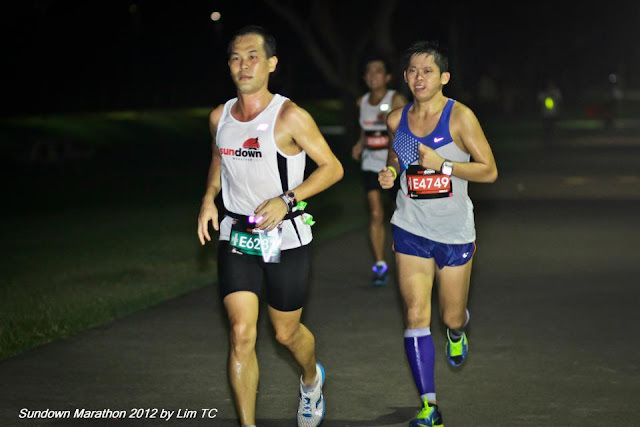 This time round at Sundown 2012, Robson was also my pacer but I eventually lost to his fast pace at 19 km marker @ ECP. Heavy downpour at my 27 km marker at ECP and I encountered many loud thunder sounds and flashy lightening. As the weather got colder, the strong winds and the pain in my foot sole due to wet shoes, I began to slow down my pace from 5:30 mins/km to 7:00 mins/km. All I wanted was to finish the race safely, with no injuries. At about 30 km marker, Asree appeared beside me, happy to see him. He encouraged me not to give up as we were about to finish the race soon. We then paced each other and saw The King Sam-E zoomed past us, followed by Yao Ming and Jasmine Goh as well in between about 35 km to 38 km. At my 40 km marker, my GPS watch recorded 3:40 hours. I told Asree that I wanted to give a hard try effort to beat my PB of 3:51 hours, with given 10 minutes to complete my last 2.195 km. Without hesitating, Asree supported my decision and told me to go for my goal. I left him at 40 km and increased my running pace from 7:00 mins/km to 5:30 mins/km. 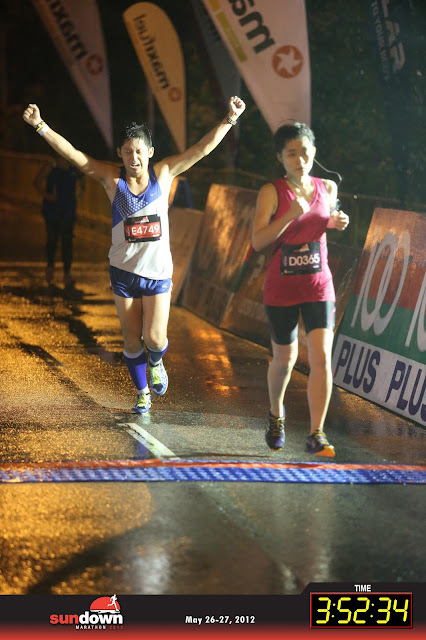 Finally, I crossed the 42km finishing line in 3:52:34 hours (net time) but was unable to break my PB and exceeded my time taken by 1 minute 7 seconds. What a wasted chance! 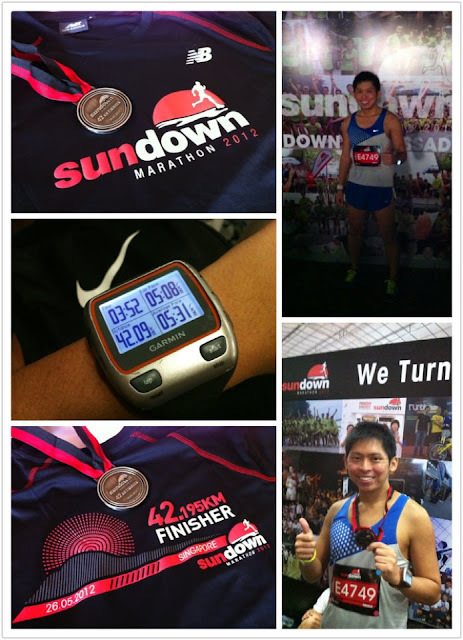 Despite my PB failure, this Sundown Marathon 2012 was a special one as I think I have done two good things. 1) I fought hard through a heavy rain in my 42km race and managed to complete a sub-4 hour marathon successfully. After the race, I gave my hard-earned 42km finisher tee and medal to my Fiancée who has been supporting me since day 1. She boosts my confidence level, and I truly believe she deserves the tee and the medal for always being there for me. 2) I dedicated my marathon effort to my company's Adecco Win4Youth campaign for raising charity fund to help and integrate young & needy people into work, in difficult environments. Will review on the run soon. Thanks all for the time. Pics credit to Sasha Farina, Asree, Lim TC, Marathon-photos.com and myself.